All of us at home are in a holiday mood. Our harvest festival, Sankranti is around the corner. House cleaning, shopping clothes for family and domestic help(s) and preparation of sweets/savories is in full swing. Its my favorite time of the year! Bachala kura Pappu is a high protein, vegan, heart warming dish loaded with nutritious greens – Malabar spinach or Indian Spinach. They go by the name Bachali in Andhra, Basale in Kannada, Vaali Bhaji in Konkani, Mayalu in Marathi and Pui Shak in Bengali. These protein-rich, vibrant green, glossy leaves are thick with a spongy texture and when cut they ooze a slimy juice similar to okra. When cooked with dal, the sliminess is not evident though. We usually cook them with masoor or tur dal or with yam (kanda bachali) and as mustard powder based stew (ava pettina pulusu). 1 In a pressure cooker, place dal, bachala kura, onions, green chilies, ginger and turmeric pwd. Add 2 cups of water and pressure cook up to 2 whistles. If cooking over stove top, cook till the dal is almost cooked. 2 Heat oil in a heavy bottomed vessel, add mustard seeds and as they jump around, add cumin seeds, urad dal, garlic, red chilies and curry leaves and stir fry for half a minute. 3 Add this to the pressure cooked dal along with salt and combine. Add tamarind paste with 1/2 cup of water and cook on slow to medium flame for 7-10 mts without lid or till you get the consistency of your choice. 4 Serve with white rice and a stir fry dish. TX) and today i tried your recipy and it workedout excellent. Lovely daal. Malabar Spinach is called poi in Gujarati. Wow… Looks creamy and delicious… We prepare spinach dhal something similar to this… Malabar spinach is ‘Pasalai keerai’ in tamil. 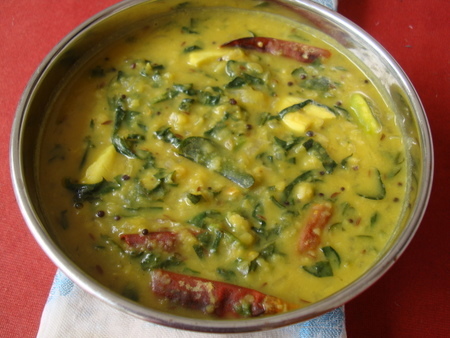 Classic and delicious dal recipe.. looks simply awesome.. thanks for sharing !! Now that’s extremely mouth watering!!! just papads and ghee to go along…HEAVENLY YUMMY MEALS!!! THANKS SAILAJA. Nice dal. Can’t wait to try it out. Can you please post a recipe for Mirchi ka salan? I was looking for a good recipe for Mirchi ka salan Curry. Lovely Dal. My favorite would be with Raw Mango!! Sailugaru, sankranthi subhakankshalu!! what ru making this year for sankranthi?? cud u post ariselu, sakinalu recipes pls? Love your blog. And nice to find my favourite dal featured here with slight variation. In north we make “Lahsuni dal palak”, but then its the tadka of rai, curry leaves and dry red chillies, that changes the flavours!! Hello, I first heard of you through Sue (sunnydays.blogspot.com) and went on to make your eggless cake with curd. It was absolutely mindblowing!! I’m stuffing a large piece of it in my mouth, as I type this response. This was my first attempt at eggless cake, which I made for some house guests who are vegetarians. They loved and so did we 🙂 thanks so much for sharing this recipe. I’m going to frame it and put it up in my kitchen (yes, it’s that good…..can’t believe something baked without egg can turn out sooo wonderful!!) Sorry, to hijack the space on this post but your cake was so good, I simply HAD to come back and thank you for it! awesome pictues sailu.Once I tried the Brazillian dish, which is chopped leaf in egg burji. Pretty decent. Hi Sailu, i just wondering could you post the recipe for spinach rice as i had it from one of my friend’s house and it tasted very good. I have blogged Spinach Rice recipe earlier. thanks sailu,will let you know how it turns out once i cook. If using a tbsp of butter, use a tbsp of maida and a cup of milk. followed above recipe to the T. Except I used sugar only 1/2 cup. ladoos turned hard. do I need to increase/decrease water. Looks so yummy..any kind of dal is my favourite. I found ur blog some time back. bachalikura pappu nooru ooristhundi..missing it in my place now.amma eppudu backyard lo penchutundi.mee atukula payasam,beans pakodi kura,kandi podi try chesanu. my husband and i loved them. and one more thing i found ur vanjaram vepudu here frndszone.com/Thread-Vanjaram-Vepudu-Simple-Fish-Roast and other recipes such as methi murgh,murgh musallam,Aloo methi,lasooni dal palak,capsicum chichen.Is it with ur permission? I just found this blog and Iâ€™m looking forward to trying some of your recipes. Iâ€™m American engaged to an Indian. I love to cook but had never tried cooking Indian food before I met my fiance. I was an expert in Mexican food, great at Greek and Italian but Indian was too intimidating. Sailu, i tried your chocolate brownies and they tasted great. i will posting it today. Please check vibaas-world.blogspot.com. Iam a tamilian married to a telegu, I referring to hundreds of andhra style recipes to please by hubby, but nothing worked until I followed you tomato pappu from ur blog…from then on your blog has become like a benchmark for all andhra recipes!!! I am a tamilian married to a telegu, I referring to hundreds of andhra style recipes to please by hubby, but nothing worked until I followed you tomato pappu from ur blog…from then on your blog has become like a benchmark for all andhra recipes!!! your bachali kura pappu is still the best looking on the internet.and I’m sure it would taste great as most of your recipes, I’m going to try it for the first time with red bachali kura that is growing in my pots right now. I visit quite often for authentic telugu dishes, to find different ways of cooking with each vegetable and also the veg Manchurian from your site was awesome. Thank you for your recipes. Please keep up the good work. 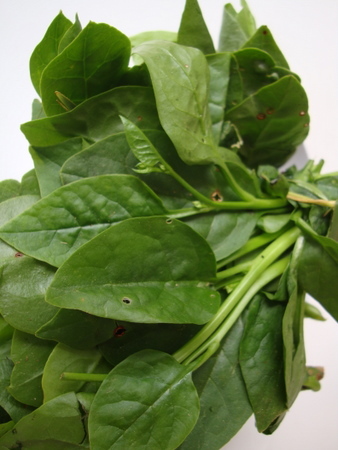 Hi Sailu-ji, Thank you for your Malabar Spinach/Ceylon spinach/ Some-other-place spinach recipe. I remember it as Vali bhaji dal. I followed your directions, except that being too tired and sleepy, ….. and with my overbearing wife sitting and jumping on my back, ….. (telling me to hurry up, already – ) , …… I put the tadka first, then sauteed the garlic slices in the same vessel, , then roasted the onions, then sauteed the thinly sliced gelatinous greens, and then added the preboiled toor dal. I put a few drops of lemon juice, a pinch of citric acid, a bigger spoonful of habanero chilly paste in vinegar, a semi- spoonful of sugar, a little MSG powder, some garam masala, a little hing, and some fresh curry leaves ( which I had forgotten to fry earlier – !@! ). Despite all these blunders, the dal tasted good, and my wife did not bat an eyelid. Indian food recipes are very forgiving if you haven’t followed directions, precisely, to the dot, ….. and especially if you are very hungry. Tomorrow, I am going to try to cook the most authentic, complicated chicken biryani from god=knows-where- place, …… with my eyes closed.